New home sales fell 4.6% in February to a seasonally adjusted annual rate of 411,000, according to a Department of Housing and Urban Development report (link opens a PDF) released today. After a whopping 15.6% jump in January, market analysts had expected only a slight drop to 425,000. In other news, median home prices moved up 3% to $246,800 while overall housing supply expanded 4.8% to 4.4 months at the current sales rate. Economists have recently pointed to a lack of supply as one of the main setbacks to a full housing market recovery. A report last week from the National Association of Realtors confirmed that housing inventory for existing homes also increased in February. 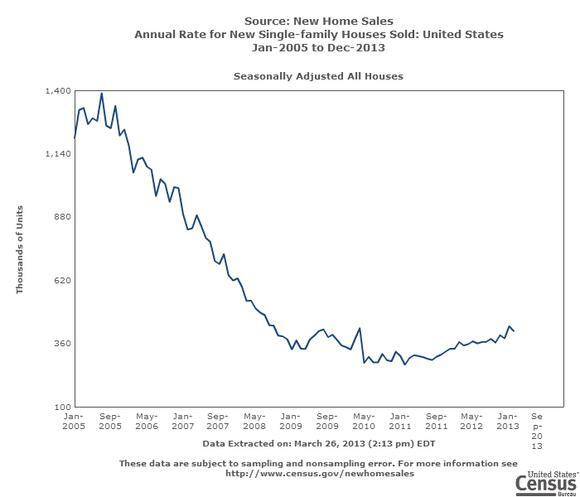 The article New Home Sales Slump, Supply Expands for February originally appeared on Fool.com.